Lena A Culpepper, Female, Widowed, died 22 Apr 1970 in Marion Co., TX. Panoloa Co., TX: Robert F. Culpepper and Lena Pruitt, 24 Apr 1898, Book F, p. 407. Lorena Culpepper, Daughter, F, Jul-1899, 11/12, S, TX AL TX. Frank Culpepper, Head, M, 40, M1, md-12 yrs, GA GA GA, Agent-Book Co.
James Culpepper, Son, M, 6, S, TX GA SC. Jimmie Culpepper, Son, M, 16, Sng, TX TX TX. Lena Culpepper, Wife, F, 57, M, md@25, TX SC GA.
Richard F. Culpepper, died 23 Feb 1953 in Marion Co., TX. Sarah Sharp, Mother, F, Oct-1817, 82, Wid, Ch 1/1, SC SC SC. Arrilla Culpeper and Clif Fields are the parents of a daughter born 16 Apr 1928 in Marion Co., Texas. Obituary of Sidney B. Culpepper, published 20 May 1995 (Page 39). This fund is based upon financial need and awarded to a student minister or church worker. The recipient of the award is chosen by the Religion Department. The Jimmie C. Culpepper Scholarship was established in 1979 by Dr. Lessie Hagen, Jimmie Culpepper’s cousin. Elder Culpepper dedicated his life to the publishing work, and this scholarship was established for students who plan to work for the church. Born in 1904, Jimmie Culpepper grew up in Jefferson, Texas. He attended Southwestern Junior College and graduated in 1925. A few years later he married his childhood friend, Erna Mae Hancock, and together they gave their lives to mission service. The Culpeppers went as missionaries to Spain soon after their marriage. They returned to this side of the Atlantic Ocean before the second World War and began mission service in the South American and Inter-American divisions where he was publishing director. After 43 years of service he retired and returned to his old hometown of Jefferson. Jimmie Culpepper died in November of 1986. “He was one of the old time colporteurs,” says Dr. Hagen. “He had lots of spirit and was a very dedicated person.” In his last correspondence with the college, shortly before his death, Jimmie Culpepper stated that he planned to be here for graduation to see his granddaughter graduate from his school. He was inducted into the Alumni Hall of Fame at homecoming in 1987. (Source: Southwestern Adventist University: http://www.swac.edu/academics/bulletin/endwdscholarships.html#culp. James Calvin Culpepper, Male, died 8 Nov 1986 in Marion Co., TX. Samuel H Culpepper, White, Single, born 1924 in Georgia, residing in Macon Co., Georgia, enlisted as a Private in the US Army on 3 Mar 1943 in Fort McPherson, Georgia. Obituary of Mrs. Betty M. Culpepper (#40030), published 14 Mar 2009. Obituary of Samuel Harold Culpepper (#36278), published 16 Oct 2012. 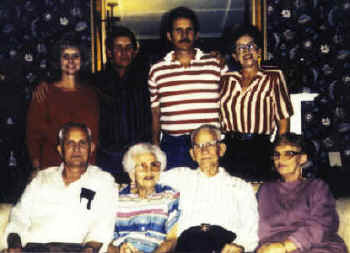 Standing are, left to right, Wanda Kay Culpepper Lacy, Paul Wayne Culpepper, Douglas Byron Culpepper, and Omega June (Judy) Culpepper Everett. E-mail written 1999 to Lew Griffin from Kim Ayers. Wanda C Culpepper, 44, married Virgil A Lacy Jr, 49, on 15 Sep 1990 in Harrison Co., TX. Matt was instrumental in solving a centuries old mystery as to the origin of the name Culpepper. See: http://gen.culpepper.com/historical/nameorigin.htm. E-mail written Feb 2012 to Warren L. Culpepper from Matthew Brady Culpepper (#36298), e-mail address.